You’ll recall Kate’s involvement with UK Scouting. While not a Patron of the organization she has taken part in a number of events with the Scouts. Many readers will remember the volunteer training exercise at Great Tower Scout Camp in 2013, with the dreadful snow and sleet. Here you see the Duchess at the 2013 Scouting parade at Windsor Castle with Bear Grylls. In these photos Kate is with the 23rd Poplar Beaver Scout Colony in East London at a December 2014 engagement. Monday, December 19: Kate, William and Harry attend the annual general meeting of their charity, Heads Together. The trio will also take part in the organization’s Christmas Party, hosted by youth support service The Mix, one of the eight Heads Together partner charities. We learned tonight that Kate, William & Harry attended a reception at Buckingham Palace this evening. There is a photo montage of Kate on Instagram wearing her red Finella dress by Preen ($1577 at Net-a-Porter in sizes XS – L). We do not know with certainty the images are of this evening’s function at BP, but it seems likely. Our thanks to HeavenLM on Twitter for the heads-up about the photos, and to Cepe Smith as well, she posted the Court Circular updates on Twitter. Another item in today’s Court Circular, word that Kate and William attended a Royal Foundation board meeting. If I’m not mistaken this is usually around the time the Foundation board meets. 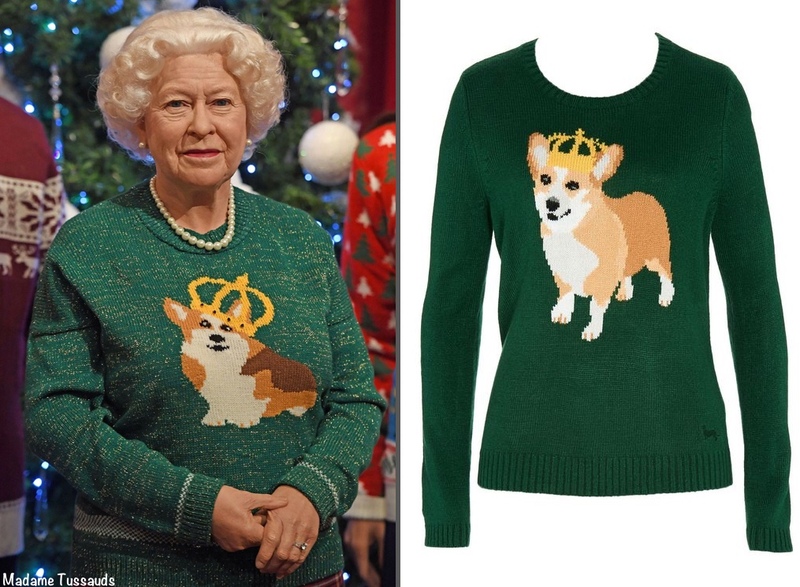 Our next tidbit involves some holiday fun, the royal family in their finest Christmas sweaters (aka jumpers). That image comes compliments of Madame Tussauds in London. With silliness set to sweep the nation as people don their daftest knit on Friday 16th December for Christmas Jumper Day, Her Majesty’s likeness didn’t want to miss out on the festive fun and was joined by Prince Philip, the Duke and Duchess of Cambridge, Prince Harry, the Prince of Wales and the Duchess of Cornwall. Christmas Jumper Day is actually a fundraiser for Save the Children. The campaign asks people to sport their wackiest Christmas sweaters on the 16th, and also donate £2 to the charity. 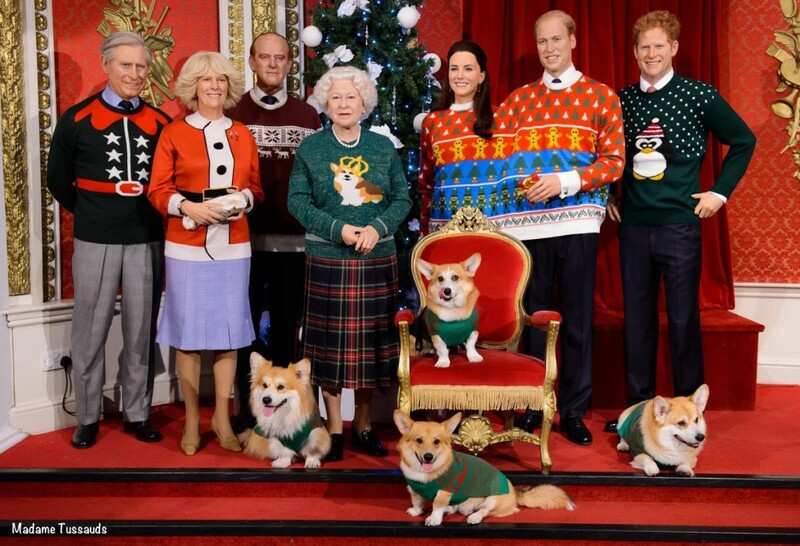 With Catherine and William sharing their own cosy double-jumper, the Royal line up was surrounded by The Queen’s favourite companions, four real corgis, dressed in their own mini-Christmas jumpers. 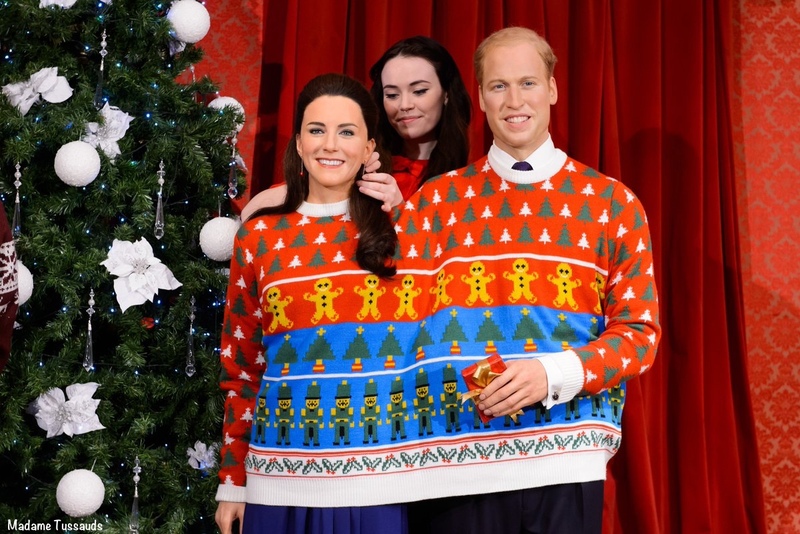 The royal wax figures can be seen wearing the knits throughout December in Madame Tussauds London, with visitors encouraged to grab a selfie with the Royal likenesses. The attraction will also give visitors the option of donating to help Save the Children. I posted the photo on the WKW Facebook page and there is quite a bit of chatter about HM’s sweater, admired by many a reader. UPDATE: it turns out the sweater was created by Bristol-based knitwear designer Amber Hards; she got in touch with me on Twitter. Amber will do custom orders, you can contact her via email: Studio@AmberHards.co.uk. As Minds initially reported on the FB page, the Queen’s jumper was made specifically for this event, and it is the only one of its kind. Minda learned this from the Marcel Le Corgi FB page. (The sweater you see on the right is a similar design I found at Peter Alexander in Australia, but it dates back to 2014 and is no longer available.) 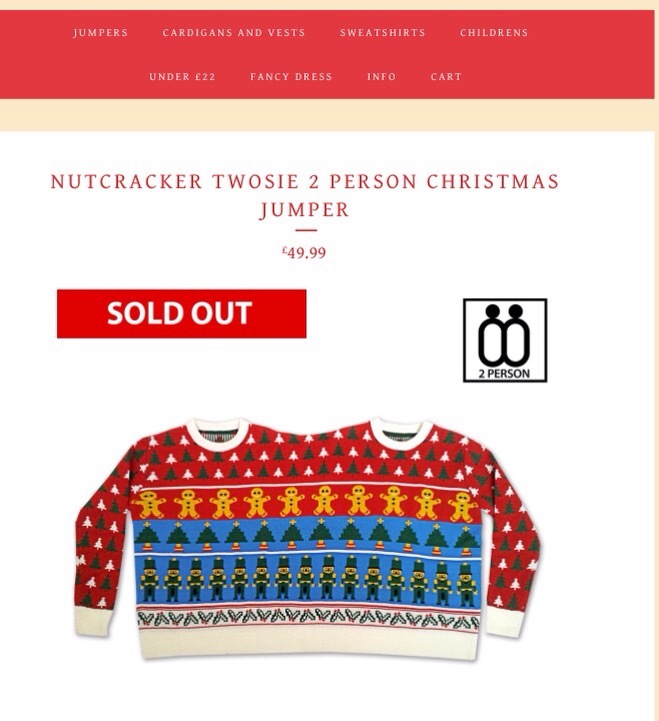 UPDATE #2: Madame Tussauds has also been in touch, letting me know the chic design worn by the Duke and Duchess is from Cheesy Christmas Jumpers. 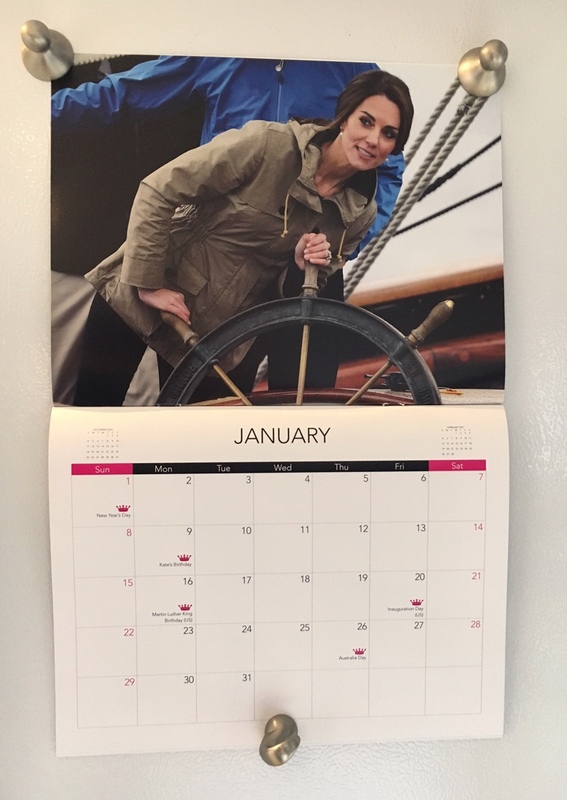 Our final topic involves our 2017 What Kate Wore calendars: we started shipping orders today! We are ever-so-excited to be showcasing Mark Stewart’s gorgeous photographs again. You may better know him as Regal Eyes on Twitter; he has been photographing the royal family for decades. Mark has traveled around the world on tours with HM and the Duke of Edinburgh; Diana, Princess of Wales and the Prince of Wales; and many others, including William and Kate. This year was no different; he was on the India/Bhutan tour as well as this fall’s Canada trip. Below you see October’s wall calendar page with its photo montage of Kate in London and India. 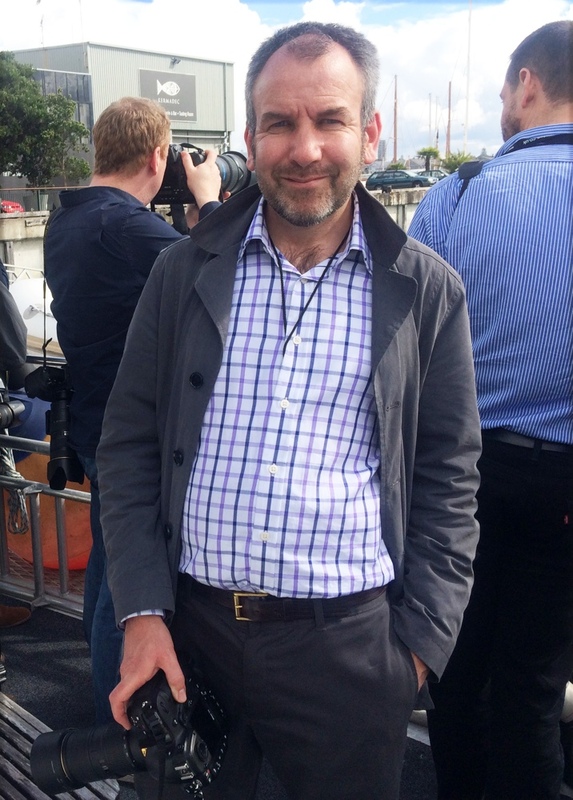 Mark has been honored with multiple awards; he has been recognized by the British Press Photographer’s Association and been named the Picture Editors’ Royal Photographer of the Year. You can follow Mark’s work on his Facebook page. 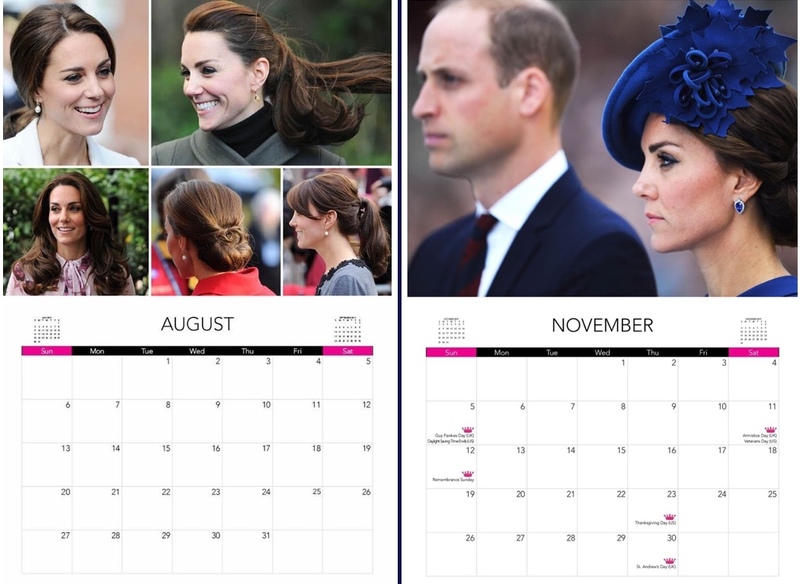 The photos for each month feature Kate in a variety of styles at a cross-section of engagements. Some months feature a single image while others offer a collage. Below, Mark’s stunning photos for the months of August and November. We had quite a few requests for a larger size calendar, one allowing room to write notes and engagements in the individual date boxes. The other input we received was a request for a calendar that you could put on your desk. 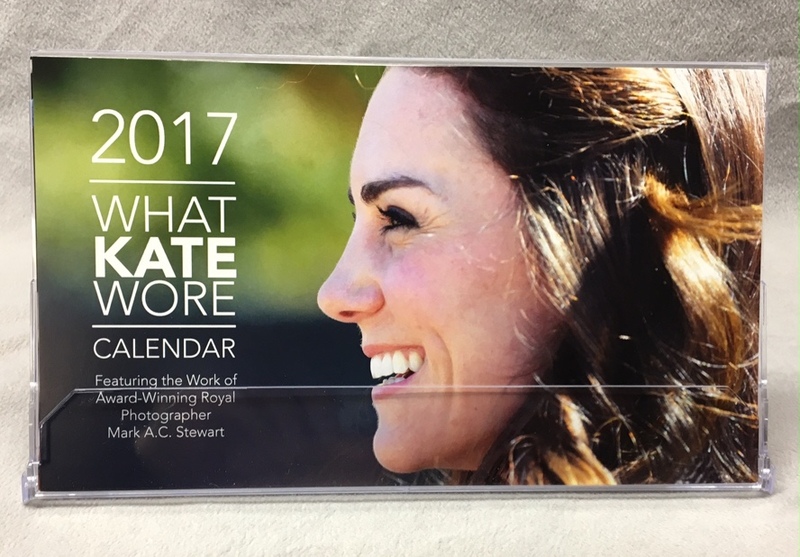 Behold, the 2017 What Kate Wore Desk Calendar. It comes in a plastic CD-style case that opens up to create an easel holding each month’s page and measures 7.5″ long x 4.25″ tall. The desk calendar features many of the photos used in the wall calendar. 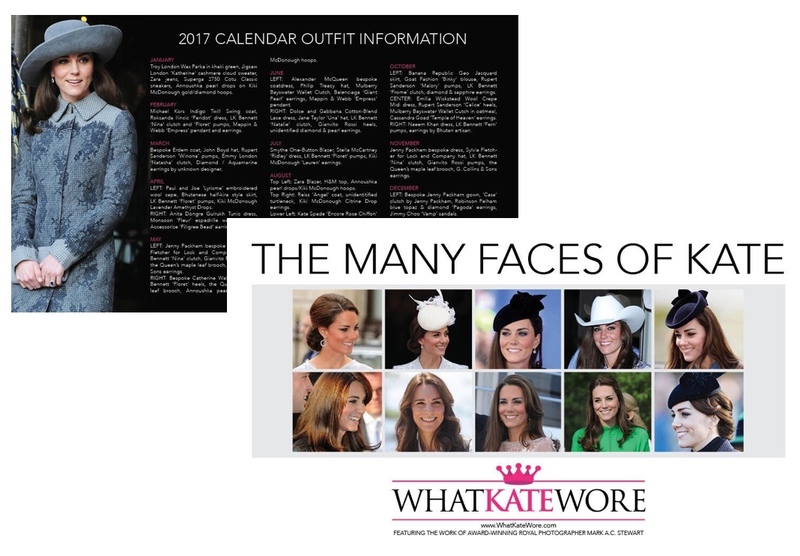 In addition to pages for each month, both calendars include our Many Faces of Kate montage, as well as information on what Kate wore in the photos. 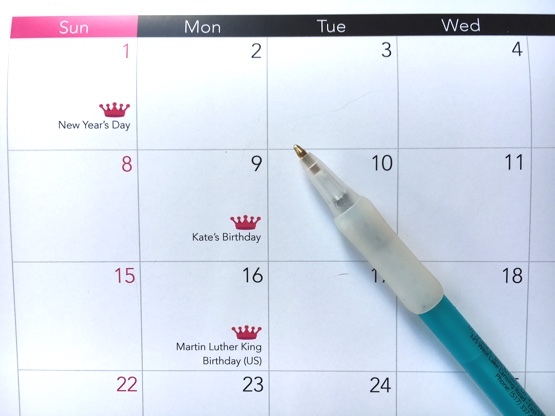 These make a great gift for yourself, or for your favorite royal watching friends. We have limited supplies of each, so ordering sooner rather than later is probably a good idea. The Desk Calendar is $12.95, and the Wall Calendar is $16.95. Shipping and handling for each is $3.50 for orders in the continental US and $6.00 for international orders. If you have already purchased your calendar, we started shipping today and expect to have all of the current orders shipped on Friday. Even though we just wrapped up our giveaway with StyleRocks, doesn’t it seem like a good time for another? We are going to give away one of each calendar, the desktop design and the wall calendar. Here’s how to enter. First Entry: For one entry leave a comment saying which kind of calendar you would like *and* where you would use it. Additional entries: For additional entries, post about the giveaway on your Facebook/Twitter/Instagram/Snapchat page and let us know you did. JUST GOT THE 2017 WALL CALENDAR — GORGEOUS PHOTOGRAPHY. THANK YOU SO MUCH FOR MAKING IT A LARGER SIZE, TOO, THAN 2016. I would love the desk calendar to spruce up my drab cubicle at work! 1. I would hang the calendar on the wall by my bed, just like I did last year, so I see it every morning and every night! I would place the large wall calendar in our kitchen so I could keep track of all my important engagements. I would love a desk calendar to adorn my cube at work! Thanks! I would love a wall calendar! Gorgeous photos, thank you. For me, it would be the wall calendar. And I’d hang it right where this year’s one of George and Charlotte is! I would prefer the desk calendar and it would go on my bedside table. I suffer from depression and one of the things my doctors say is to always get out of bed, dressed and ready to go out, even if you feel like sleeping all day and hiding. Emulating Kate’s style has helped me immensely in doing this. I’m on a very low budget and am still able to find pieces that work at thrift stores and Goodwill. She has helped me so much, as has sites like this one and other replikators. The calendar would be further inspiration for me to get up, out and help others who also may suffer with anxiety and depression. Oooh hard to choose but I think I prefer the Desk Calendar and would have it on my desk at work. Everyone knows I am a royalist! I would hang the wall calendar next to my side of the bed so I could be inspired when I wake up in the mornings! I would love to have the desk calendar on my desk at the office so that I can share it with friends and colleagues. Wall calendar, I would keep it in my bedroom…where I get dressed everyday, as an inspiration not only for dressing for work and ideas, but always looking your best no matter how you feel inside. Thanks! I would be thrilled to receive a wall calendar to hang in my bedroom! In the early 80’s I had a wall calendar of Diana. I would be happy to use either calendar on the desk at home. I’d love the desk calendar – perfect way to start the day at work! I’d like to win the wall calendar. I’d hang it on my bedroom, next to my bed to wake up every day with a smile. 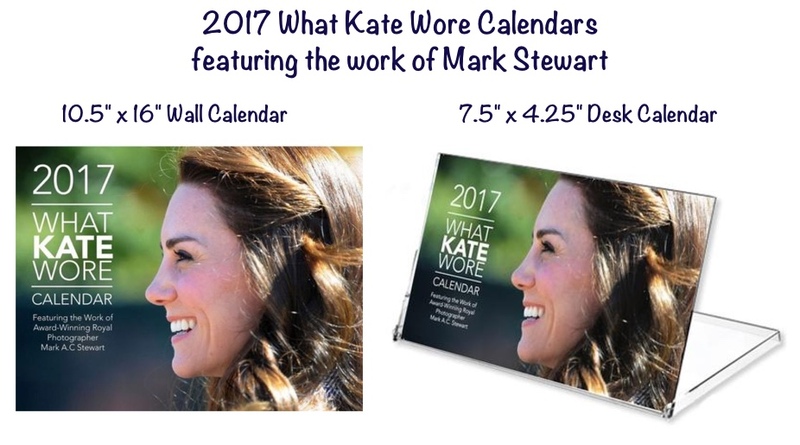 I would love the wall calendar to hang by my computer so I can admire Kate’s impeccable fashion! I would love a wall calendar to hang in my bedroom. I would love to have the Kate wall calendar to hang in my bedroom. For many years I used to hang her mother-in-laws calendar and it would be wonderful to be able to now have Kate’s. Yay! Another giveaway! I would definitely love the wall calendar. I’d hang it on my bedroom wall for daily inspiration of what to wear and to make myself “stay calm and act like the Duchess of Cambridge.” Thanks! I’d love a wall calendar to hang on the notice board of my English Language Centre in Siatista Kozani Greece! I was a great fan of the late Princess of Wales and now of the Duchess of Cambridge!!! Desk calendar for my desk at work. The code here is mostly jeans, quilted vests etc, pretty casual, so it’d be nice to have some glamour! I would love to have the wall calendar to add to my refrigerator! I would love the wall calendar to brighten up my dreary office. I would love a wall calendar to hang in my dressing room as inspiration for when I am getting dressed in the morning! Lovely!! I would love the desk calendar for work, to be honest. A desk job needs some fabuloous-ness! I would love a wall calendar and would put it in my kitchen where I could enjoy it the most! I have tweeted this page as well on Gmail and Pinterest. I tried facebook but the page wasn’t accessible. I will try again later for certain. I would love, love, love the wall calendar! I would hang it in my kitchen where I could see all of my appointments along with the beautiful photographs! I would like the wall calendar so I can hang it next to my, “what would Kate do?” Sign in my office. Everyone knows I love her! I would like the wall calendar for my daughter’s bedroom as she is such an admire of Kate. The wall calendar! I would pin it above my desk in my TA office. The wall calendar would be great! I hang in on my fridge where it’s easily seen! I would like a desk calendar… What a great option to include. I would put it on my dresser. Thanks for the giveaway! The wall calendar is the one I would choose. I would hang it in my kitchen since that is where i spend the most time. I would love the wall calendar and would hang it in my office at work! Lovely Calendars!! Either would be great for me. I tend to record things on a daily basis on my calendar so the wall one would be perfect for that. The desk calendar is convenient and being able to stare at those beautiful photos on a daily basis is an added bonus. I would love the wall calendar so I could write on each day. Will hang it the kitchen. Would love the desk calendar – it would have a place of pride on my desk at work! I would love the desk calendar. I would keep it at work so that I could glance over and see Kate and smile during a hectic work week! I tweeted about the giveaway. YOU ARE THE BEST!!!! I prefer the larger calendar….and the ability to write on it. I’ve learned sooooo much from this blog – in addition to DoC’s sartorial choices many commenters are refreshing with their observations…..such an oasis. I would love the desk calendar to put on my bedside table. Each morning I would look at it as inspiration to pop out of bed to see what interesting tidbits about the Duchess and the rest of the royal family have been doing. I would like either! They’re both lovely. I would love to have a desk calendar to admire the Princess all day long while at work! Thank you for the opportunity. I would love a desk calendar ! A desk calendar for sure! It will be on my desk where I check WHAT KATE WORE every day. Both are so lovely! But the desk calendar would be a perfect addition to spruce up my work desk. I would love the wall callender. I could hang it in my room and use it to remind me of all the things I need to do and all I can write in all of her, William and Harry’s engagements (I run an update account on them on twitter and Instagram). I would love to have the wall calendar; all the pictures are really nice, so it’d be great to have them at that size. I’d hang the calendar in my bedroom for some inspiration first thing every day! Lovely! A give away! If I were chosen, I would select the desk-top calendar, so I could easily have it on my desk at work. Because my desk is within a cubicle and there is not very much room or wall space, the desk calendar would be best. Thanks for the opportunity! Fantastic giveaway! I’d like a desk calendar for my desk at work so I can get inspired by Kate’s style and grace every day! I would love the wall calendar. I would use it in my bedroom area to give me inspiration daily to smarten up my wardrobe and to admire her sense of style, grace and beauty!!!!!! Thank you for the contest! I would love a desk calendar to look at it when I am working (I’m a student)! Thank you for your amazing job on the blog, it’s always a pleasure to read your articles. I love the desk calendar and it would be great for daydreaming while sitting at my desk. I would love the desk calendar so I could bring some Kate class and style with me to my often tedious job! Thank you for doing a fantastic job again this year! I really enjoy Mark Stewart’s photography. I’d put up the wall calendar next to my desk at work. It would be nice to look at daily. I would love the wall calendar for my office at work! I’d love a desk calendar! Currently at work I have the wall calendar from WKW pinned to my board and look at it daily to keep meetings and priorities straight (in addition to getting a little Kate-spiration). Thank you for putting these together, I’ve come to look forward to these every year for Christmas and love flipping to a new month. Happy Holidays to you Susan! I would love to hang the wall calendar in my kitchen! The photos are beautiful! I would LOVE the wall calendar!! As someone whose room is always filled with anything and everything Kate, this would be such a great and cute addition! The amount of newspaper clippings I have hanging in various place around my room, showcasing her Royal Tour wardrobe are never ending! By far my favorite Royal/”celebrity” in the world. I even have a Pinterest board dedicated to her that has quite a lot of pins!! Looooove her!! I would love this calendar for my desk at work to brighten my day so I’d need the desk top one!! I would love either one to give to my mom! She would love it! Thanks for the giveaway! I would love the wall calendar – it would be the perfect gift for my MIL. We share an interest in the Duchess’ style and I know she would be thrilled! I would love the wall calendar. I normally have a calendar next to my bed against the wall in my bedroom, but this year I could not find one that I liked enough to spend an entire year with. I prefer a hard copy calendar to the calendar on my mobile phone. I prefer hard copy calenders with beautiful visuals, e.g. photographs. I would love a wall calendar to keep by my desk. What a lovely want to keep up with daily engagements! I would like a wall calendar and I would put it up in my bedroom. This is such a lovely idea! I’d love the wall calendar ❤️ Merry Christmas! I would love a wall calendar. I am a teacher in Australia and I would put it on the wall in my classroom. Love the photos! I would live a Kate wall calendar! Would go great with my home made collage that is framed on my wall! Cheri Crane Kizaur shared What Kate Wore’s post. Thanks for doing another drawing! These calendars are lovely!! I just “earned” a real office with walls for the first time in my career and I would love a desk calendar to brighten it up a little! Thanks!!! The desk calendar for me and I would use it for my work desk at home. I would love a desk calendar to take to work! It will keep me inspired the whole year! Wow, the calendars are beautiful. I would like the wall calendar, and I would use it in my bedroom. I already ordered mine, so I’m not entering the contest. But I’m so excited to get the desk calendar!! I can’t wait to see her Christmas outfits coming soon!!! As a Royal enthusiast from Australia, have followed the journey of the Royals from the pre-Diana time, travelled to London to take in the atmosphere of Kate and William’s wedding and had a week of great memories and enjoy our chance to be part of the new Royal Family life; so a calendar of Kate’s world for 2017 would be welcome. I would love a wall calendar to use to hang near my desk to keep track of appointments and birthdays. I would adore a desk calendar! I think Kate is so pretty, I’d adore admiring her everyday whilst I write my appointments on the pretty calendar! It would look so lovely sitting on my desk!!! 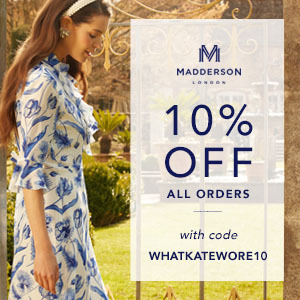 I am a huge fan of Kate Middleton and would love to win the dekker calendar for my desk at home! I love collection Kate regalia! Thank you! I would love a wall calendar! These are absolutely stunning. As someone who has loved the British royals for years (I even wrote a biography of Kate for children), I love gorgeous photos of them. Thank you for making these available!